Slip / trip and fall accidents are one of the most common accidents that occur every day. If you have slipped / tripped and fallen on someone else’s property and suffered an injury as a result of the property owner’s negligence, you could be entitled to compensation for your pain and suffering, medical bills, loss of income, and more. 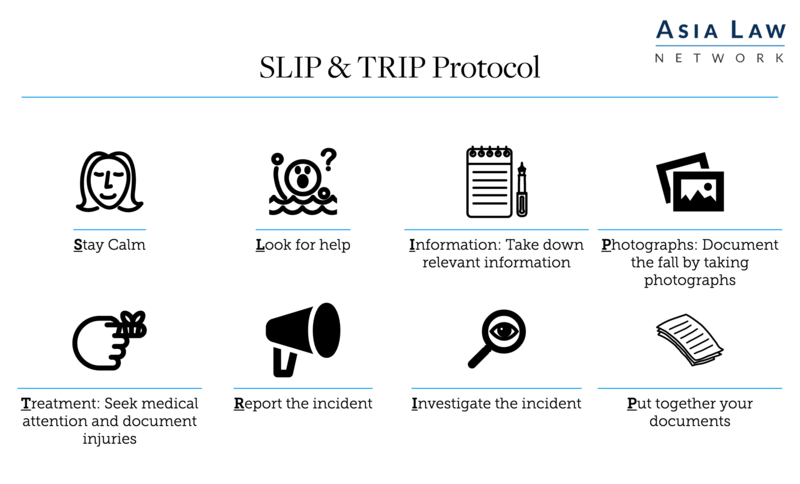 If you ever find yourself in such a situation, just follow the below SLIP & TRIP protocol to aid your claim against a negligent property owner. It is understandable for you to feel angry and flustered following a painful fall, but it is crucial that you stay calm and focus on the following important steps. Seek help from an employee or the manager of the premises where you suffered an accident. They will know the area best and will be able to get you the medical help you need fast. Once you have found help, collect the names, particulars and contact details of any witnesses, and of the people who rendered you help at first instance. They may be very helpful in proving your version of events down the road. If they are willing to help, ask them to give you a short witness statement at the scene of the accident, or as soon as possible. Also, document your own condition after the fall. These include photographs of your injuries taken at the scene of your accident or at the hospital. For example, take photographs of any torn or wet clothing, or any visible injuries suffered as a result of the fall. Another essential step to take is for you to seek medical attention and document your injuries. This is important simply because you cannot establish a personal injury claim without any documentation of injury suffered. If you have fallen in a store, ensure that you report your fall to the store management and that they report your accident according to their company protocol. If you have fallen anywhere else, make sure that your fall is reported to the building management or landlord. It is also important to make a police report for documentation purposes. Write via email or post to the management of the premises where you suffered your accident, informing them of your accident and that you intend to make a claim. Ask them to provide you with further information such as CCTV recordings of your accident and their accident report. It is important to keep a record of these communications, as it may help pinpoint liability later on. Need legal advice for personal injury claims? If you need advice for accidents related matters, you can get a Quick Consult with Viviene or other lawyers. With Quick Consult, you can check out in minutes and for a transparent, flat fee of S$49, the lawyers will call you back on the phone within 1-2 days to answer your questions and give you legal advice. This article is written by Viviene Sandhu from Clifford Law and was first published on Clifford Law’s website. Joyce graduated with a Bachelor of Laws (Honours) degree from the University of Durham in 2013. 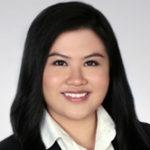 Upon her return to Singapore, Joyce completed the Singapore Bar Admission Course where she attained distinctions and was admitted as an Advocate and Solicitor of the Supreme Court of Singapore in 2015. Joyce has assisted in a wide variety of cases at both the State Courts and High Court levels, including matrimonial matters, defamation claims and contractual disputes. Driven by her strong belief in the need for justness, Joyce strives to help her clients achieve an ideal solution with their best interests at heart. Joyce in bilingual in English and Mandarin. She also speaks conversational Cantonese and Hainanese. In her free time, she enjoys baking for her friends and family, and modern calligraphy.